NFL Alumni and NFL Teams are making safe, non-contact football instruction more accessible than ever with a series of community-based, summer day-camps produced by Pro Sport Experience. On behalf of the NFL Alumni Association, the Chicago Bears, Green Bay Packers and Tennessee Titans, Pro Sports Experience brings NFL Alumni Heroes and professional, USA Football Certified coaches to more than 80 communities in the summer. Available to kids ages 6-14 years old, kids learn to run, throw, catch, defend, form-block, form-tackle and compete from the most experienced and famous coaches in the game. Through safe, non-contact football instruction, the objective is to teach athletic skills, football skills and life skills to kids. Moreover, by developing more athletic, competitive and confident players, Pro Sports Experience helps grow participation in upcoming flag and tackle leagues. The move to “non-contact summer camps” is boosted by fact that Flag Football is now America’s fastest growing recreational sport. Like tackle players, the flag players want the best skill development coaches and programs available for their benefit. Pro Sports Experience non-contact summer camp markets include Atlanta (GA), Connecticut, Chicago (IL), Dallas (TX), Kansas City (KS and MO), New Jersey, New York, Pennsylvania and Wisconsin. 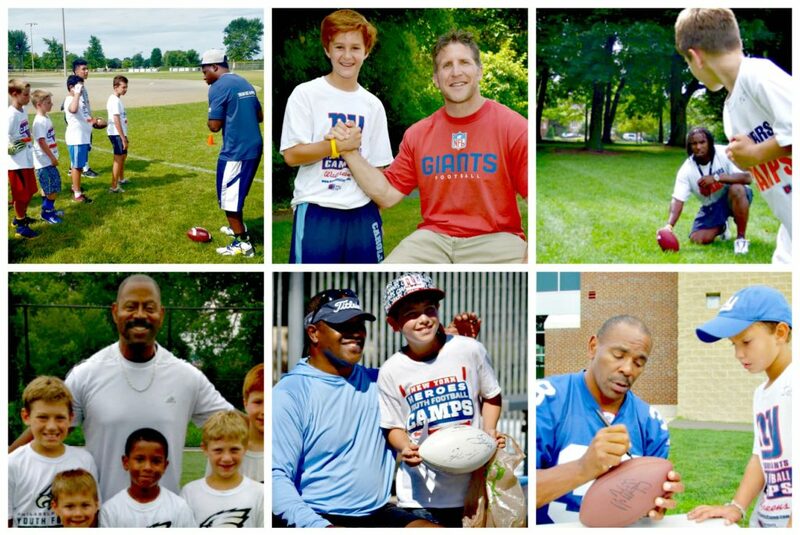 NFL Alumni Heroes from your favorite local team provide supplemental instruction. These are former players, fathers and family men that get great reward by teaching kids through football. Atlanta: Former Falcons like Steve Bartkowski, Billy Johnson, Wallace Francis, Bryan Scott and Lawrence Jackson. Chicago: Formr Bears like Rashied Davis, Nathan Vasher, Kris Haines, Al Harris, Michael Haynes, Jason McKie and Jim Morrissey. Connecticut: Former Giants like Stephen Baker, Rodney Hampton, Bart Oates, Odessa Turner and Perry Williams. Dallas: Former Cowboys like Alex Albright , Demetric Evans, Doug Donley, John Gesek, Kevin Mathis, Tyson Thompson. Wisconsin: Former Green Bay Packers like John Anderson, Johnnie Gray, Kurt Larson, Dexter McNab, Darryl Ingram and Kurt Larson. Kansas City: Former Chiefs like Derrick Alexander, Deron Cherry, Anthony Davis, Bill Mass or Will Shields. New Jersey: Former Giants like Stephen Baker, Rodney Hampton, Bart Oates, Odessa Turner and Perry Williams. New York: Former Giants like Stephen Baker, Rodney Hampton, Bart Oates, Odessa Turner and Perry Williams. Tennessee: Former Titans like Blaine Bishop, Brad Hopkins, Donald Nickey, Derrick Mason, Neil O’Donnell and Al Smith. All experience levels are welcomed from ages 6-14. The program addresses skills for flag, tackle or even recreational backyard leagues. In the big picture, they want kids to develop athletically. From there, it’s about building confidence. Coaches build genuine confidence through dynamic instruction, encouragement, repetition and fun. When kids develop composure, confidence, humility and a willingness to serve the team, they will carry those skills throughout life. Ultimately, the goal is to have fun. The coaches and heroes rose to the top because they love the game and the challenges it offers.